(Newser) – The death toll has risen to more than 35 in yesterday's shooting of striking South African miners by police, which has become one of the deadliest confrontations since the end of apartheid, reports the Telegraph. The country's police minister says many others were injured and the toll is likely to rise. Another 10 people, including two police officers and two security guards, died in related violence earlier in the week. 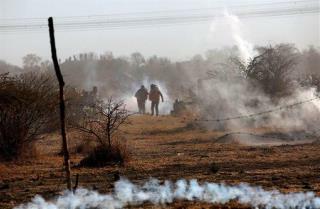 As strikers marched on the mine 40 miles northwest of Johannesburg yesterday, police tried breaking up the march with water cannons, then stun grenades and tear gas, but opened fire when a group of machete-armed miners charged police lines. It never fails. Give unions an inch, they want a mile. They become arrogant & violent. Then police must restore public safety & order.